As technology is progressing, the world is presenting us a cornucopia of latest high end gadgets and smartphones. But whatever amazing features these phones might have, one thing that has literally pulled back technology is the constraint in battery. 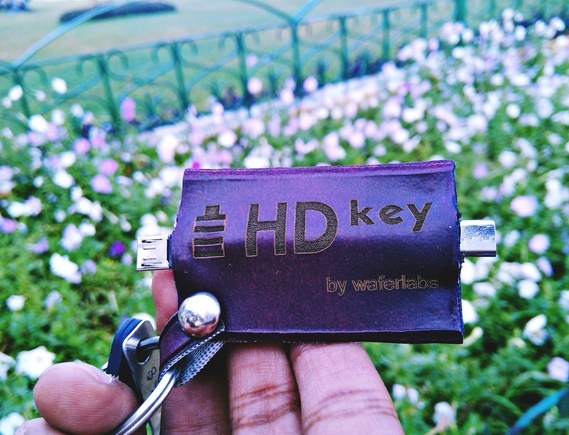 HDKey by WaferLabs is the first phone-to-phone charger. This device will enable a person charge his phone from a friend’s battery and need not carry large chargers, bulky adapters with him. Besides being a charger, it has plenty of more utility. HDKey will facilitate high speed file transfers at a rate which is 20 times Bluetooth speed. HDKey is fashionable lightweight small device, weighing 6 gram which has two ports that can fit into two mobiles. HDkey has a built in NFC with it which is able to automate Tasks or write your business card on it. Hence if you want to give your contact to someone, just tap on the HDKey on a friend’s phone. The project is definitrly an innovative and low cost product for the consumer industry. We hope to see an amazing device soon.